This was an interesting procedure. The cowl is originally molded as part of the fuselage. 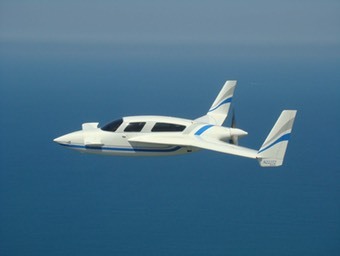 However, it needs to be removable for installation and maintenance of the engine. Here is where I do that big cut to remove the cowl. It’s an interesting process! The manual tells us to carefully cut on the pre-marked line in 6” segments. We then are to use tongue depressors and a hot glue gun to help support the cowling as it gets cut away. 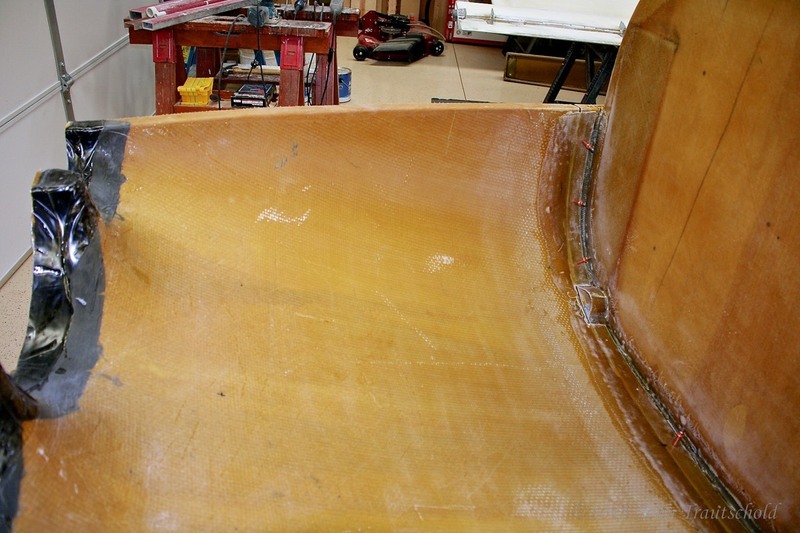 Additionally, the flange is not to be cut until we’re ready to remove the lower cowling. I was dubious that these large “popsicle sticks” would actually hold everything together. But they did!!! This is one of those big, scary cuts we need to do on this project, removing the lower cowling piece from the fuselage! A look at the cut from the inside. The popsicle sticks temporarily hold the cowling in place during the cut! 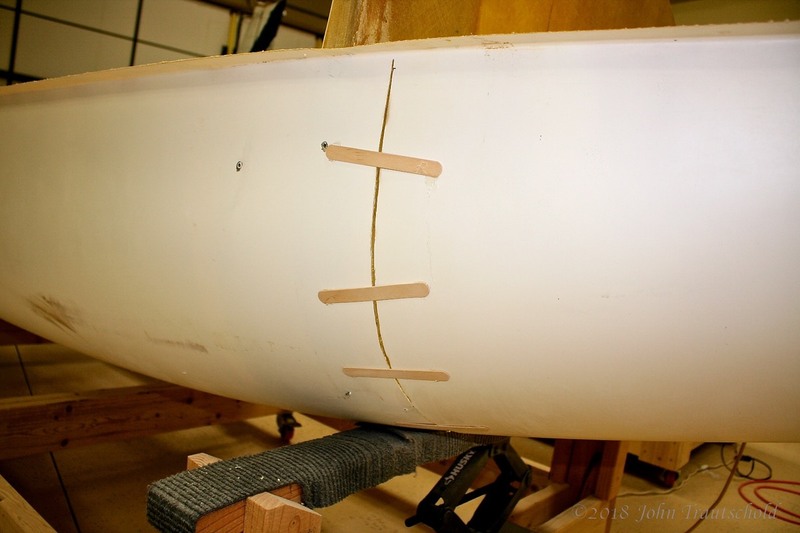 Earlier you saw the cut lines for the lower cowling. Here, the cowling is now removed. I needed to do a bit of sanding and straightening where the cut was made. Before the lower cowling is removed, a flange needs to be created to be used for attaching the cowling back onto the fuselage. That’s literally done with duct tape and a few fiberglass layups. 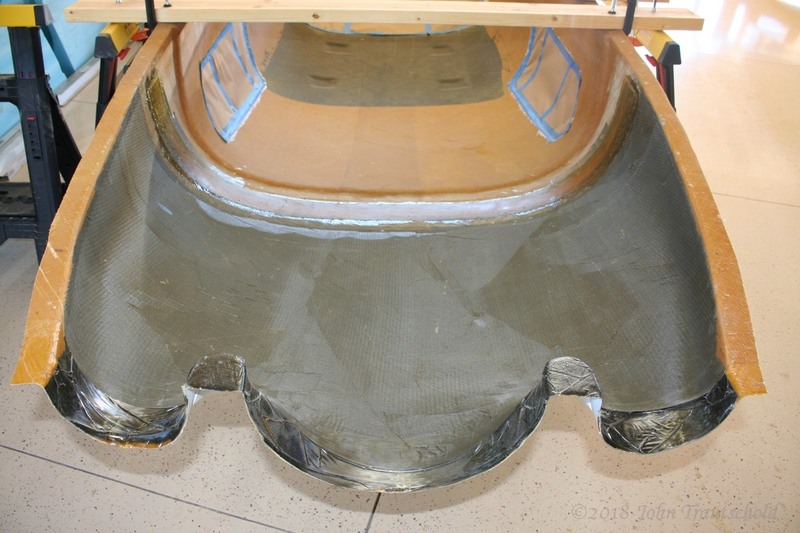 The duct tape is used to help separate the flanges from the fuselage once the epoxy is dry. 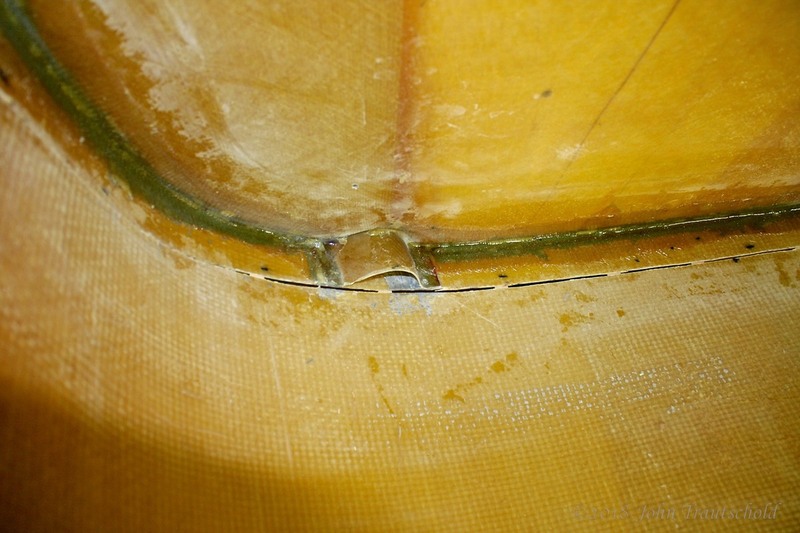 Epoxy and fiberglass does not stick to the plastic-like surface of the duct tape. 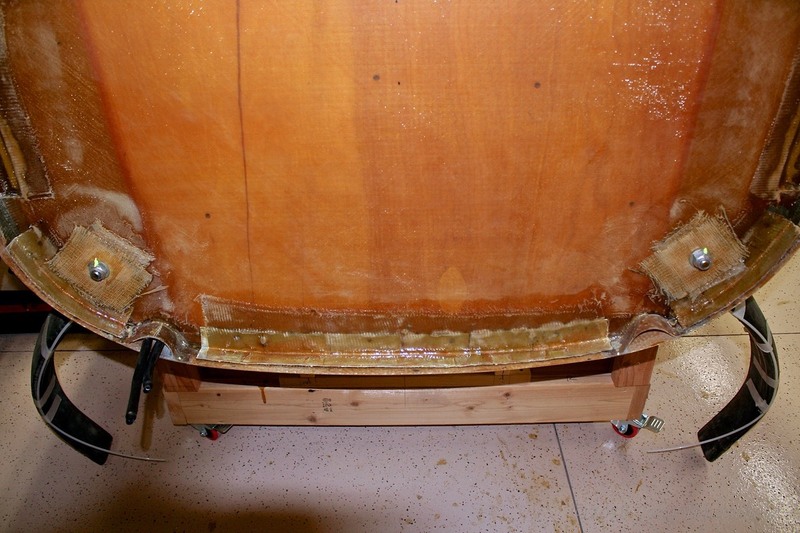 Before removing the lower cowling, a flange needs to be created out of BID and epoxy. The flange is used to reconnect the lower cowling to the fuselage proper. Here I am straightening and sanding the flange. And here’s the lower cowling clamped to my worktable for finishing off those edges of the flange. Here's a shot of the lower cowling piece temporarily clamped to my worktable so that I can straighten and sand the flange. Naturally I need to test to make sure that I can put the cowling back on. In the photo below I’m using some clecos to temporarily hold everything in place. What comes off goes back on. In this photo the lower cowling is reattached to the fuselage to check for fit. Many builders are doing a modification that creates a sleeker aircraft by eliminating all of the external bumps created by the screws used to hold the cowling to the fuselage. Another flange needs to be created that the lower cowling slips into. Some internal brackets are also added that lock the cowling into place. Here's the finished flange that the lower cowling slips into. 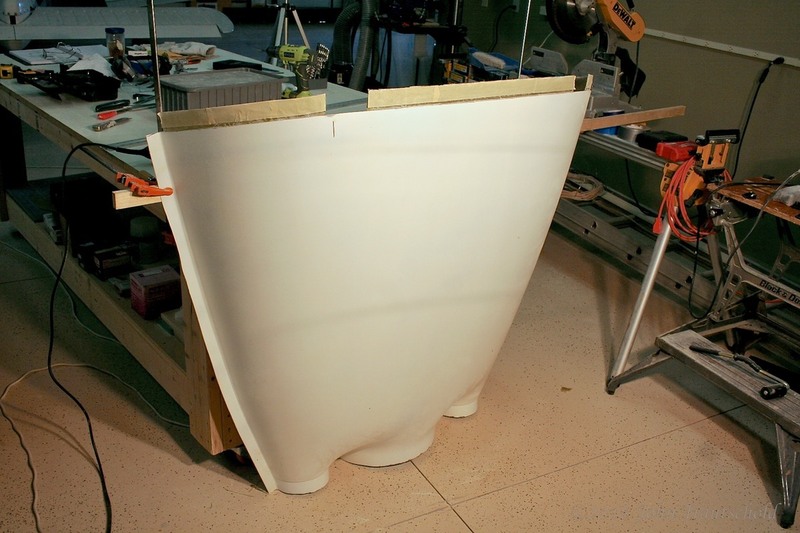 I also need to remove the upper cowling and prepare it in the same way as the lower cowling. I started that procedure by flipping the upper half of the fuselage upside down after first having done those same cuts while using the “popsicle sticks” to hold the cowling in place. 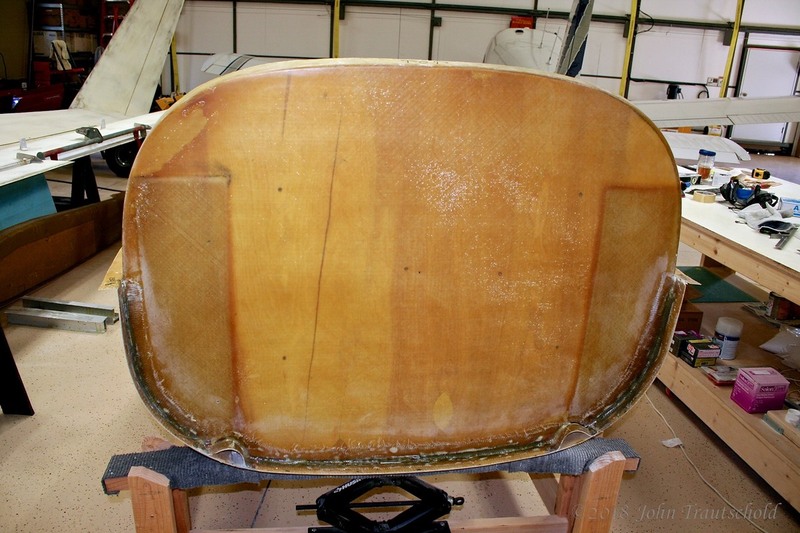 Here’s a photo showing the initial flange layup done before removing the cowling. I cut and temporarily supported the upper cowling (with tongue depressors and hot glue) while it was still right-side up. I've finished the lay-ups for the flange. I still need to finish the removal of the cowling followed by cleanup of the flange, and then creating another flange on the firewall itself to hold the upper cowling in place. That won’t happen until the upper half of the fuselage is attached to the lower half. At some point the entire airplane fuselage needs to be flipped upside down and that’ll be the perfect time to do the support flange. There’s still more to do though, including installing the battery shelf and landing light. Click here for the battery shelf installation.